One surprising omission from my list, was—ironically—a product which I was already aware of. Sonuus (creators of the G2M guitar/pitch-to-MIDI converter app for iOS, which I basically wrote was the “least worst” such app I’d tried!) are perhaps better-known for their hardware guitar-to-MIDI interfaces, such as the G2M and B2M. In 2011, they launched a USB-based version, the i2M Musicport, which combined pitch-to-MIDI with an audio interface, into a single device. The i2M package is no whopper, coming in a small cardboard box containing just the i2M, a quick-start guide and a USB Type A-to-Type B cable (i.e. the type you’d usually use with a USB printer). A small nitpick at this stage: because it has to be folded into the i2M’s pretty cramped packaging, the USB cable has some rather nasty kinks in it. The lead looks quite solid, and so I am not that concerned about whether the kinks would damage the wires inside, but the cable looks a bit of a mess once unfolded. I hope it will straighten out given time, but in the meantime I bought a retractable USB A-to-B lead, which fits more easily in the guitar gig-bag. Your mileage (and concerns about quality) may vary. In this review, I want to look at how the i2M works with a platform which I believe it was not specifically designed to support, but thanks to its class-compliance, it does anyway: iOS, and in particular, the iPad. “Seasoned” iOS musicians may well be asking at this point: does the i2M need a powered USB hub between it and the iDevice? (Many USB audio and MIDI devices do, as the iPhone and iPad often can’t deliver enough power to the device to make it work, so a powered USB hub has to be used.) Good news: no powered hub is required—the iDevice recognises and powers the i2M with no trouble whatsoever. This means you can be “off-grid” with your iPad, i2M and instrument, and still be able to record even if there’s no power-socket within reach. If all is well, the grey “Sonuus” logo along one “face” of the i2M glows red, then bright-green or orange (I like that, myself), and you’re ready to go. The iPad recognises the i2M as both a CoreMIDI and CoreAudio device—I checked the available interfaces in Multitrack DAW (audio) and MIDI Monitor (MIDI), and “i2M Musicport” showed up in both. You do not have to use both of these if you don’t want or need to—the i2M can act as a standalone audio or MIDI interface, or both in tandem. I understand that “continuous red” indicates a problem with the i2M, but thankfully haven’t encountered this yet! If this approach strikes you as a bit “fiddly”, you can also switch patches on the i2M via MIDI program-change messages. You can set a program-change ID number for a patch using the editor application, and send these messages to the i2M either from the editor itself (if the i2M is connected to the same computer running the editor), or from another MIDI sequencer or device connected to the same computer. I thought I would have a go at creating a “demo” track, to show what the i2M is capable of “out of the box”. At time of writing, I recently participated in NaSoAlMo 2014, and for my album for this challenge, I wanted a little instrumental interlude to go roughly at the halfway point of the track sequence. It’s quite common for guitarists to try MIDI-guitar systems, who then find the results are perhaps not what they were hoping for. I should mention at this stage, that I have owned a Roland-based MIDI guitar “rig” (a GI-10 guitar-MIDI converter, and Steinberger guitar with Roland GK2 divided pickup) since the late-1990s, so I feel I have an above-average level of experience with “guitar-synths”. This means I have learned a few “tricks” which help me avoid some of the pitfalls (one of which being, that playing a guitar synth like a regular guitar can lead to some undesired sonic-effects). I’m not going to do a detailed side-by-side comparison of my Roland GI-10 and Sonuus i2M here, for various reasons—mostly, because of the considerable difference in price. A Roland setup, for example, requires a guitar with a dedicated Roland GK pickup system; the pickup alone costs more than the Sonuus i2M, and the current Roland guitar-synth unit, the GR-55, will not leave you with much change from £500. With all the dedicated hardware, even my twenty-year-old GI-10 and Roland GK-equipped Steinberger provides more advanced MIDI capabilities than the Sonuus (the Roland kit is polyphonic, and in many cases tracks more accurately), but I’d say that such a comparison is unfair. The Sonuus has no dedicated pickup to assist it, but instead has to “listen” to a regular guitar signal—with all the potential interference that may carry with it—and parse relevant musical information from this signal with as little delay as possible. With the above in mind, I must say I have been very impressed with the Sonuus i2M’s MIDI-tracking. It helps if you can give the i2M as clean a guitar-signal as possible—select the neck pickup (if the guitar has one); tone control down to zero (to reduce any harmonics which might “confuse” the i2M); mute unplayed strings where you can (or use a string-dampener such as the Buznut); and so on—and remember that the i2M is monophonic, so don’t feed it double/triple-stops, chords and the like, unless you’re seeking avant-garde effects (or just confused silence!). In terms of alternatives: in the price-range of Sonuus’ products (particularly with their recent, extremely generous offers), there aren’t really any. As mentioned, a Roland GR55 and GK3 pickup would cost around ten times the amount I picked up my i2M for—on that measure, the GK3 on its own would set you back about twice as much. The Fishman TriplePlay MIDI guitar system (at around £350-400 in the UK at this time) is cheaper, but not by much—this and a Roland setup are technically superior to the i2M, but with the price differential I’d expect this. From there, the only alternatives at anything approaching the price of the i2M, might be MIDI “guitar-type” controllers like the You Rock Guitar and JamStik, and they’re still around the £200 mark. They have their advantages, but if you want to play “regular” guitar via a hardware interface and control MIDI instruments with it, at the price of the i2M the only alternative is probably a digital guitar input (such as iRig HD; Apogee JAM; Fender SLIDE; Peavey AmpKit HD and so on), coupled with a pitch-MIDI converter app on the iDevice. There are plenty of them, but as I’ve written, many are simply awful, to the point of being unusable (Sonuus’ own G2M app, ironically, being the “least-worst” in my anecdotal experience). So, after all the above: can I recommend the Sonuus i2M Musicport? 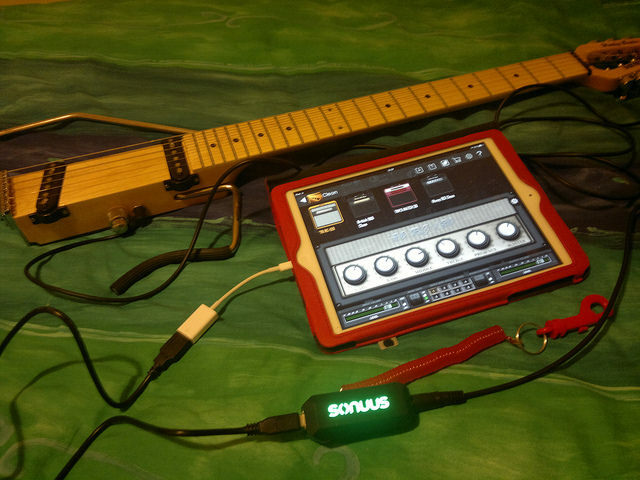 If your use-scenario is similar to mine (go-anywhere-capable guitar-recording, with monophonic MIDI-playing capability, with guitar and iPad/iPhone): most definitely. As long as you are aware of its limitations—single-note MIDI; the need to adapt your playing for best results (as with most MIDI-guitar solutions); 16-bit audio—and these are not show-stoppers for you, then the i2M is an extremely useful device to add to a mobile-recording setup, and especially if you can take advantage of a good offer, highly cost-effective as well. The i2M is compact, versatile and reliable, and I for one would want to replace it ASAP if for some reason I lost the use of it.